Pears cooked in sugar, spice and whiskey. 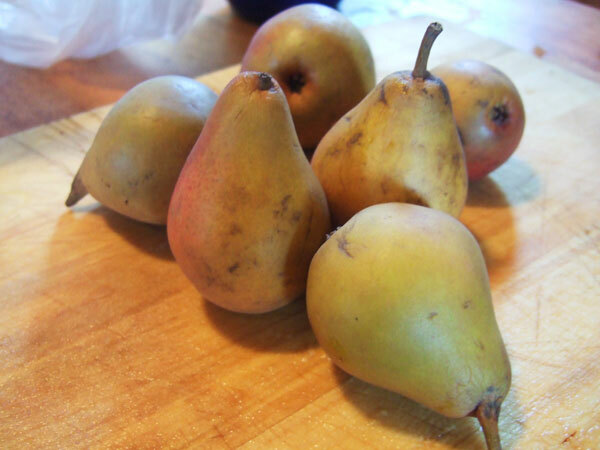 The second recipe we picked on-air at We Dig Plants was Carmen’s selection: Brandied Pears. This recipe come from one of the earliest American kosher cookbooks, Aunt Babette’s Cookbook, published in 1889. The recipe is rather long, so if you’d like to see the original go here. Whiskey pears? Now there’s an idea. Inspired by “Brandied Pears” from Aunt Babbette’s Cook Book by “Aunt Babbette,” 1889. 1. Pare the fruit: remove the skin but leave whole with the stem on. Add to a medium saucepan and cover with water. Add sugar. 2. Bring to a boil over medium-high heat and continue to boil until pairs are tender: 5 minutes for small pears, longer for large pears. Test with a fork for tenderness. Remove with a slotted spoon and set aside. 3. Turn heat to high. Add spices to sugar syrup. Boil 8 more minutes. 4. 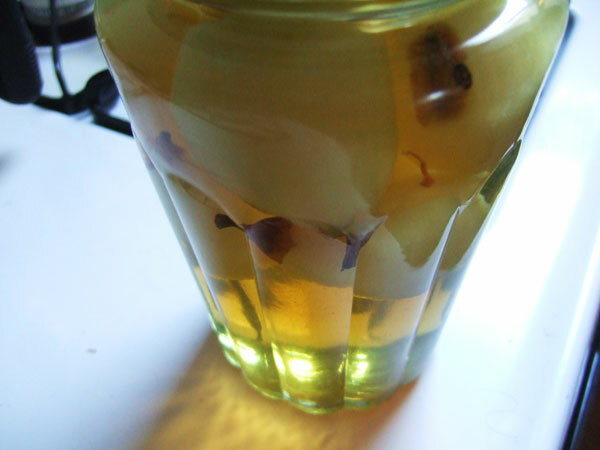 Put pears in a canning jar and add whiskey; pour in hot sugar syrup. Depending on the size of your jar, you may have to add a little more hot water so that the liquid reaches the top. Cover, seal, and let cool. Store in refrigerator for up to one week. I let the concoction sit in the fridge for four days; when I finally opened the lid, I was apprehensive. It smelled astringent. I speared a delicate little pear and took a nibble. The result: extraordinarily. The whiskey flavor blended perfectly with the spices, and the soft sweetness of the pears offset any alcoholic bite. They are just delicious. I dub this recipe a winner, but I don’t know what to use them for — decorations? desserts? Does anyone have any suggestions? I serve pears poached in red wine on a bed of tapioca cooked in coconut milk. But I have a feeling that the whiskey pears could take a chocolate bite too. The old fashioned kind of Hot Fudge sauce made by hand maybe? yum, so simple and delicious. i would totally add them to a chocolate custard tart or maybe folded into some gingerbread and served with whipped cream. Love your blog! How ’bout with some vanilla ice cream? I had pears and a rum sauce with the same a while back, and it was fannnntastic.